Finance for $673 per month at 6.25% APR for 72 months with $4,462 down payment. Payment expires on 04/30/19. Estimated Finance payment based upon 6.25% APR for 72 months, with a down payment of $4,462. Excludes title, taxes, registration, and license fees. Some customers will not qualify. See your authorized dealer for complete details on this and other offers. Residency restrictions may apply. Lease for $717/month for 36 months with $4,462 due at signing including $0 Security Deposit and 10,000 miles per year. Payment expires on 04/30/19. Estimated Lease payment based on 36 months and $4,462 due at lease signing. Cash due at signing includes $3,746 capitalization cost reduction, which includes $650 acquisition fee, plus a required security deposit of $0, and first month's lease payment of $717. Excludes title, taxes, registration, and license fees. Total monthly payments equal $29,553. Mileage charge of $0.25 per mile over 10,000 miles. Not all consumers will qualify. Residency restrictions may apply. Finance for $758 per month at 6.25% APR for 72 months with $5,028 down payment. Payment expires on 04/30/19. Estimated Finance payment based upon 6.25% APR for 72 months, with a down payment of $5,028. Excludes title, taxes, registration, and license fees. Some customers will not qualify. See your authorized dealer for complete details on this and other offers. Residency restrictions may apply. Lease for $881/month for 36 months with $5,028 due at signing including $0 Security Deposit and 10,000 miles per year. Payment expires on 04/30/19. Estimated Lease payment based on 36 months and $5,028 due at lease signing. Cash due at signing includes $4,148 capitalization cost reduction, which includes $650 acquisition fee, plus a required security deposit of $0, and first month's lease payment of $881. Excludes title, taxes, registration, and license fees. Total monthly payments equal $35,829. Mileage charge of $0.25 per mile over 10,000 miles. Not all consumers will qualify. Residency restrictions may apply. Finance for $1,064 per month at 6.25% APR for 72 months with $7,064 down payment. Payment expires on 04/30/19. Estimated Finance payment based upon 6.25% APR for 72 months, with a down payment of $7,064. Excludes title, taxes, registration, and license fees. Some customers will not qualify. See your authorized dealer for complete details on this and other offers. Residency restrictions may apply. Lease for $1,053/month for 36 months with $7,064 due at signing including $0 Security Deposit and 10,000 miles per year. Payment expires on 04/30/19. Estimated Lease payment based on 36 months and $7,064 due at lease signing. Cash due at signing includes $6,012 capitalization cost reduction, which includes $650 acquisition fee, plus a required security deposit of $0, and first month's lease payment of $1,053. Excludes title, taxes, registration, and license fees. Total monthly payments equal $43,898. Mileage charge of $0.25 per mile over 10,000 miles. Not all consumers will qualify. Residency restrictions may apply. Finance for $1,100 per month at 6.25% APR for 72 months with $7,301 down payment. Payment expires on 04/30/19. Estimated Finance payment based upon 6.25% APR for 72 months, with a down payment of $7,301. Excludes title, taxes, registration, and license fees. Some customers will not qualify. See your authorized dealer for complete details on this and other offers. Residency restrictions may apply. Lease for $1,087/month for 36 months with $7,301 due at signing including $0 Security Deposit and 10,000 miles per year. Payment expires on 04/30/19. Estimated Lease payment based on 36 months and $7,301 due at lease signing. Cash due at signing includes $6,214 capitalization cost reduction, which includes $650 acquisition fee, plus a required security deposit of $0, and first month's lease payment of $1,087. Excludes title, taxes, registration, and license fees. Total monthly payments equal $45,343. Mileage charge of $0.25 per mile over 10,000 miles. Not all consumers will qualify. Residency restrictions may apply. Finance for $1,034 per month at 6.25% APR for 72 months with $6,863 down payment. Payment expires on 04/30/19. Estimated Finance payment based upon 6.25% APR for 72 months, with a down payment of $6,863. Excludes title, taxes, registration, and license fees. Some customers will not qualify. See your authorized dealer for complete details on this and other offers. Residency restrictions may apply. Lease for $1,023/month for 36 months with $6,863 due at signing including $0 Security Deposit and 10,000 miles per year. Payment expires on 04/30/19. Estimated Lease payment based on 36 months and $6,863 due at lease signing. Cash due at signing includes $5,840 capitalization cost reduction, which includes $650 acquisition fee, plus a required security deposit of $0, and first month's lease payment of $1,023. Excludes title, taxes, registration, and license fees. Total monthly payments equal $42,667. Mileage charge of $0.25 per mile over 10,000 miles. Not all consumers will qualify. Residency restrictions may apply. Finance for $809 per month at 6.25% APR for 72 months with $5,369 down payment. Payment expires on 04/30/19. Estimated Finance payment based upon 6.25% APR for 72 months, with a down payment of $5,369. Excludes title, taxes, registration, and license fees. Some customers will not qualify. See your authorized dealer for complete details on this and other offers. Residency restrictions may apply. Lease for $885/month for 36 months with $5,369 due at signing including $0 Security Deposit and 10,000 miles per year. Payment expires on 04/30/19. Estimated Lease payment based on 36 months and $5,369 due at lease signing. Cash due at signing includes $4,485 capitalization cost reduction, which includes $650 acquisition fee, plus a required security deposit of $0, and first month's lease payment of $885. Excludes title, taxes, registration, and license fees. Total monthly payments equal $36,344. Mileage charge of $0.25 per mile over 10,000 miles. Not all consumers will qualify. Residency restrictions may apply. One of the most dependable and sturdy trucks in its segment is the brand new Chevrolet Silverado 2500HD, available at our Macedon dealership. This heavy-duty truck is backed by a powerful engine and sturdy framework. It results in its unmatched towing capacity. Extra balance and stability are ensured in the new Chevrolet Silverado 2500HD, available in Macedon, by features, like Digital Steering Assist and Trailer Sway Control. Not to forget that you can accomplish even the toughest of tasks while being seated within a quiet and comfortable interior that always has room for your gear. Van Bortel Chevrolet carries a range of models of this vehicle in its new inventory. 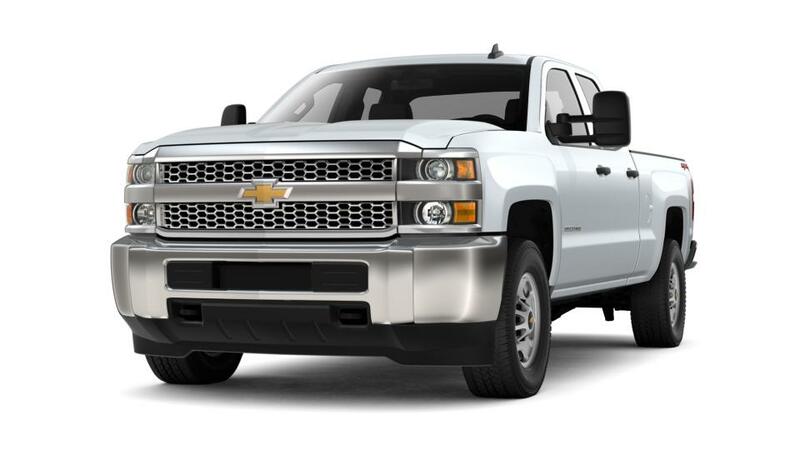 So visit us to test-drive the brand new Chevrolet Silverado 2500HD in Macedon today!